Most of us work very hard to take good care of others. You do a good job in knocking down your projects at work, you take care of your family well, you spend time with your friends, you help others who are in trouble, etc. Have you ever stopped for a moment and gave some thought about how much time or effort you spend in taking care of yourself? 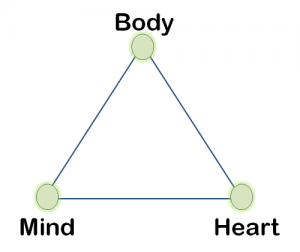 Mind, body and heart are three essential parts of yourself. Do you pay enough attention to all these three aspects of yourself? In my opinion, all these three should be well balanced, and taken care equally. If you’ve never consciously paid attention from this angle, following few points will get your thinking going in that direction. For most part, we take care of our mind well. We geeks are pretty good at keeping our mind sharp by working on challenging projects, solving complex problems, etc. But some of you might be in a job where you keep doing the same routine every day, which is not challenging. If you are in that situation, volunteer yourself to take-on some interesting and challenging project. If that is not possible, probably you should consider finding another job that will keep your mind sharp and challenged. But, always remember to balance work and life with a purpose. Reading books is another good way to keep your mind energized. Apart from reading books related to your field, you should also read books on other fields that you are not familiar with. The key thing in keeping your mind engaged fully is doing only the things that you love the most. Spend some time to think about what activities you don’t like in your typical day, and figure out a way to replace those with activities that you love to do. Perform some creative work. Give some work to the right side of your brain. I’m not even 10% as creative as my 5 year old daughter. She can come-up with absolutely amazing things out of nothing. I’ll admit, I’m far from that. But, I love creative things, and I’m inspired by my daughter to be creative and give some work to my right brain. Keep “Learn and grow” as your motto. It is very hard to keep your mind sharp when you don’t take care of your health. If you are not in good shape, it is difficult to keep your focus and get fully engaged on things you love. Most of us could make lot of improvement in taking care of our body. When is the last time you hit the gym? Have you been performing your annual health check-up regularly?. “I don’t have enough time” is just an excuse for not doing things that matters the most. You don’t need to have a 6-pack, or a slim body as projected by the media to be healthy and feel great. You just need to eat right, and exercise regularly. Setup a daily exercise routine. Don’t force yourself in doing an exercise routine that you don’t like. For me, I hate to hit the gym everyday. My routine is to play tennis (which I love) three days a week, and rest of the days I hit the gym with the focus of doing routines that will help with my tennis game. Gym is not the main focus for me, but tennis is. Remember that taking care of yourself is not selfish. If your mind is not sharp, and if you are not healthy, how can you be helpful to others? I’m sure you’ve seen folks who are extremely sharp, who knows how to keep both their mind and body in excellent condition, but are ruthless and will put everybody else down to gain an advantage. It is a shame to keep your mind and body in excellent condition, but not your heart. All the wealth and health in the world won’t make you feel satisfied, if you don’t have a good heart; you’ll always feel that you are missing something, and you can’t quite figure out exactly what it is that you are missing. Everyday take few moments to slow-down and appreciate everything around you. Be thankful for every person in your life who’ve made this life possible for you. When it comes to relationships throw your logic away, and trust your heart, you’ll never go wrong. Even if you go wrong in those situations, you’ll still feel good in your heart. In difficult situations, after you’ve done all your analysis using your mind, if you are still not sure what to do, go with what your heart says. We should trust our intuitions and feelings, as much as we trust our mind. Be kind and humble. Remember to smile always. Just a genuine smile that comes from your heart is enough to brighten someone’s day. Excellent words from a pragmatic person….. Thanks for the inspirational words! Nice to read this from a geeks perspective. Very few people pay attention to wonderful facts. Wonderful reminder! I need to keep this in mind more often. Thanks for the reminder to appreciate the simple and good parts of life, Ramesh. Ramesh, thank you for your kind and inspirational blog. We get so caught up in our work and chores that we forget to take care of ourselves. Thanks you…… Very good article Ramesh……..
You just reminded me of the things which I knew but forgot. Thanks alot. As a Christin i love Deepak’s work. The Hindu’s believe that icky feeling You get in Your gut when You are uncomfortable in some situations is what makes us sick. Run do not walk away from jobs that make You uncomfortable. We coders are the gate keepers the Power is ours. Everyone else in a company can be replaced easily. Because it takes years to get as good as Ramesh. There are billions of sites that need to written and out of 7 billion people there is only a handful of us. according to the french writer Gustave Flaubert , life is only illusions. So we have to go throurgh as if it was a dream. It is an art to listen to heart. If you haven’t done that in your life, you need to be trained before you can tell if you are listening to the heart. Thanks for posting this articles. You’ve enlighten us and help to remember the important cores in life. The best post ever, thank you. i always read ur technical articals…………….., i enjoed it thanx………..
Great view you present .. spread some love to yourself and others..
You just mentioned the very essence of Aikido. Therefore I like it so much. Thanks for your blog. Keep going ! I like this article, I have been practicing yoga in the last months to balance my mind, my body and my hearth (emotions) so I can help myself and others in a better and harmonic way.